A city of bizarre contrasts, Kolkata doesn’t let a visitor go without evoking strong reactions. One moment you hate the city with fuming rage, the next second you feel affectionate toward it. Among the things that make you cling to this enigmatic city is the opportunity to eat good food at no great loss to your wallet. 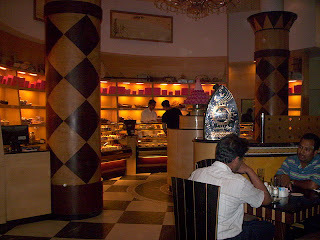 Is a vignette of Kolkata’s glorious eating traditions, going back to when the city was Calcutta. More than 80 years ago by Mr. and Mrs. J. Flury set up this British-style tea shop in the eastern Indian city. 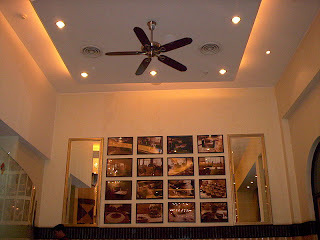 The building was renovated a few years ago and stands in the heart of Kolkata’s downtown–the pulsating Park Street. 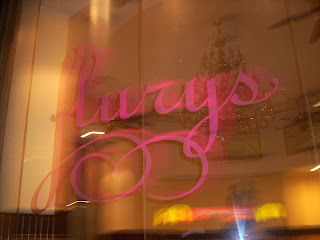 “Do try to keep an evening free for coffee at Flurys,” I had been advised. Most of the trip had gone by without heeding that advice. As we entered the last week of our stay in Kolkata, I grew fidgety. How could I leave without eating at Flurys? I had been planning this for months. So one humid evening, we set out to discover the British eating experience. Taking the metro to Park Street meant we literally had to work up an appetite by walking a fair distance as evening wore down to dusk. Once inside, the trek seemed worthwhile. The atmosphere is elegant yet informal. A great venue for relaxed conversation and some delectable bites. I ordered a cup of cappuccino, a cinnamon roll and a chicken patties. Hey, I did say I walked long to reach this place. I deserved to indulge a bit, did I not? Both my choices proved delicious. 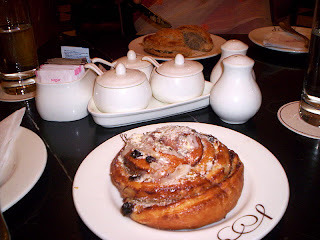 The roll was a fluffy, crispy dough, packed with raisins and nuts and smeared with powered sugar on top. The patties wasn’t dripping in oil, yet, packed with wholesome minced chicken cooked to perfection. 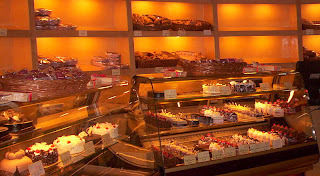 Flurys has an extensive cakes and pastries collection, along with European chocolates. I am not much of a sugar addict, so I didn’t buy any, but these are highly recommended for those with a sweet tooth or two. An evening well spent and tucked neatly into the memory files. As I passed by the gossamer reflections of a Flurys evening, I thanked my advisers. Wow, my mouth is watering. Thanks for sharing. For me Kolkata is both exhilarating and ironic.The exhilarating part is walking on the roads around Park Street- and finding names like Mirza Ghalib Street to Shakespeare Sarani to Gorky Sadan, it is a literary travel of sorts. And then the deep irony of the US consulate being situated on the Ho Chi Minh road is unlikely to be missed by anyone. Above all, at a more personal level, walking into a bookstore and finding that I had missed listening to Gulzar by an hour. Glad to share, Cesar and Jamie . :)Bhupinder, glad to see you drop by. You couldn’t be more correct. Calcutta is an all-inclusive melting pot, acknowledging and even internalizing literary as well as other artistic influences from the world over. I felt that appreciation is depreciating a bit in the face of the mass, crass and alarmingly homogeneous commercial culture that’s taking over our cities. The Gulzar miss sounds terrible. I would lament that, too. All in all, I still found Kolkata to be more character-filled than Delhi.